Don't let the funding process be hijacked to gut America's bedrock environmental protections. 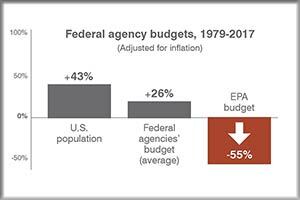 EPA’s budget has been devastated. Right now, in real dollars, it’s less than half what it was in the late 1970s — even as our population size has increased by 100 million people and our economy has doubled in size. And leaders in Washington have recklessly proposed further slashing the EPA’s funding by nearly a quarter, leaving a budget-starved agency unequipped to carry out its mission of protecting the health and safety of the people of your state. You deserve better. Take action today, and tell Congress: Don’t let the funding process be hijacked to gut America’s bedrock environmental protections. I'm writing today to ask you to ensure that in all current and future budget decisions, EPA funding -- at minimum -- remains at its current levels. Our state relies on EPA to ensure our air is safe to breathe, our water is safe to drink, our children are protected from dangerous lead exposure and toxic lands can be restored to safety. Our communities cannot afford to lose any of the valuable grant funding we receive from EPA. We're counting on you to keep us safe by calling for Congress to protect EPA's budget.